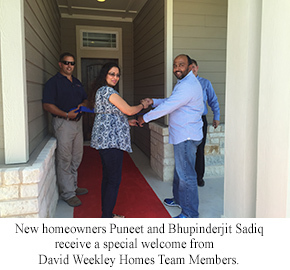 AUSTIN, TX (September 3, 2015): David Weekley Homes welcomed its first new homeowners to the Buda community of StoneRidge. Puneet and Bhupinderjit Sadiq received a special red carpet welcome to celebrate moving into their new home. The David Weekley Homes Team surprised them with Bhupinderjit’s favorite dessert of tiramisu from The Cheesecake Factory. The couple also received a special gift of custom dog tags with new address for their two dogs, Diesel and Dory. “The Sadiq’s are our first David Weekley homeowners in StoneRidge. We are excited to have them move in and hope that they will make many happy memories in their new home,” said Ken Swisher, Division President in Austin. For more information about David Weekley Homes in StoneRidge, contact 512-821-8881 or visit www.davidweekleyhomes.com.